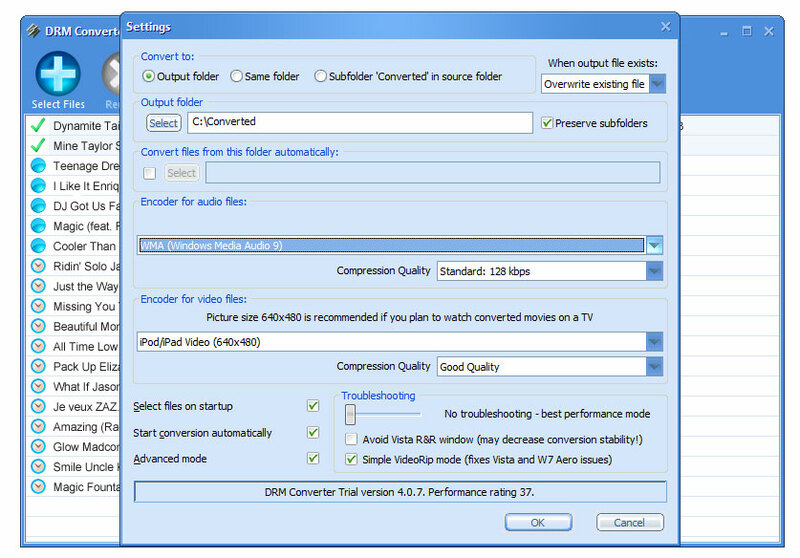 To use DRM Converter - DRM Remover Software as RAX to WMA converter (Rhapsody to WMA converter), select WMA from "Encoder" drop-down list and set a desired WMA quality parameter in "Compression Quality" drop-down list in DRM Converter's Settings. Select RAX files (Rhapsody files) for conversion using the "Select Files" button in DRM Converter's main window toolbar (you can use Ctrl or Shift to select two or more files) or using drag&drop (for example from the Windows Explorer). Also you can drag&drop a folder with files or a folder structure. You will see all selected RAX files (Rhapsody files) in the DRM Converter's main window. To delete a RAX file (Rhapsody file) from this list, select it and click on the "Delete" button in DRM Converter's main window toolbar. Once the RAX files (Rhapsody files) are present in your list, click the "Convert" button to convert RAX to WMA (convert Rhapsody to WMA).